Cumberland Gap National Historical Park of Kentucky is the latest national site to be honored on a large format coin. Released by the United States Mint at noon ET today as part of the series of America the Beautiful Five Ounce Silver Uncirculated Coins, it is composed from .999 fine silver to a diameter of three inches. 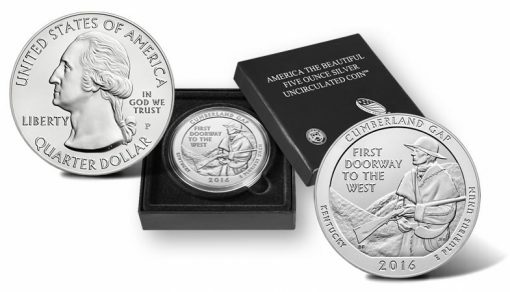 2016-P Cumberland Gap National Historical Park Five Ounce Silver Uncirculated Coins arrive encapsulated, set inside a protective outer box and come with a United States Mint Certificate of Authenticity. The coin is the 32nd in the program overall, and the second issued in 2016. Cumberland Gap National Historical Park was established in 1940 and lies at the border between Kentucky, Virginia and Tennessee. Throughout history, the gap served as a natural passage through the Appalachian Mountains. Today, the park offers visitors the chance to walk the historic Hensley Settlement, partake in Gap Cave tours and witness some of the incredible scenery of the region. 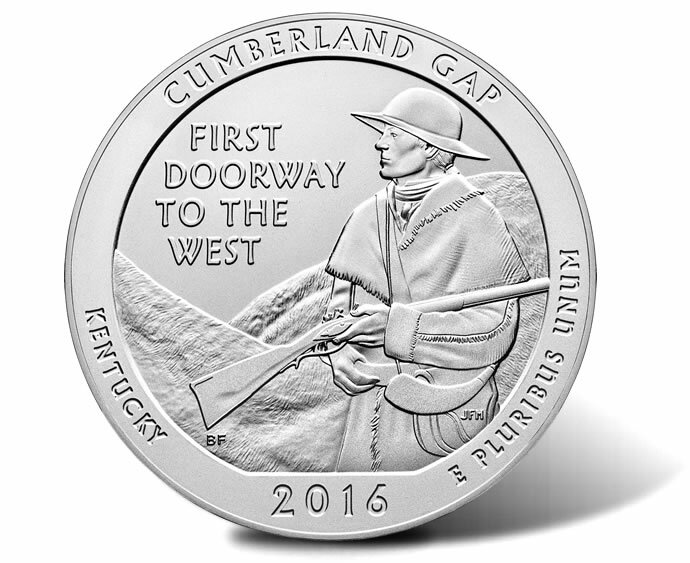 Developed in consultation with representatives of Cumberland Gap National Historical Park, the coin’s reverse of a frontiersman gazing across the mountains is representative of the Gap’s status as the first great gateway to the West. The scene was created by United States Mint Artistic Infusion Program (AIP) artist Barbara Fox and sculpted by United States Mint Sculptor-Engraver Joseph Menna. Inscriptions around the image read CUMBERLAND GAP, FIRST DOORWAY TO THE WEST, KENTUCKY, 2016 and E PLURIBUS UNUM. This same image also appears on the smaller Cumberland Gap quarters released as part of the U.S. Mint’s America the Beautiful Quarters® Program. 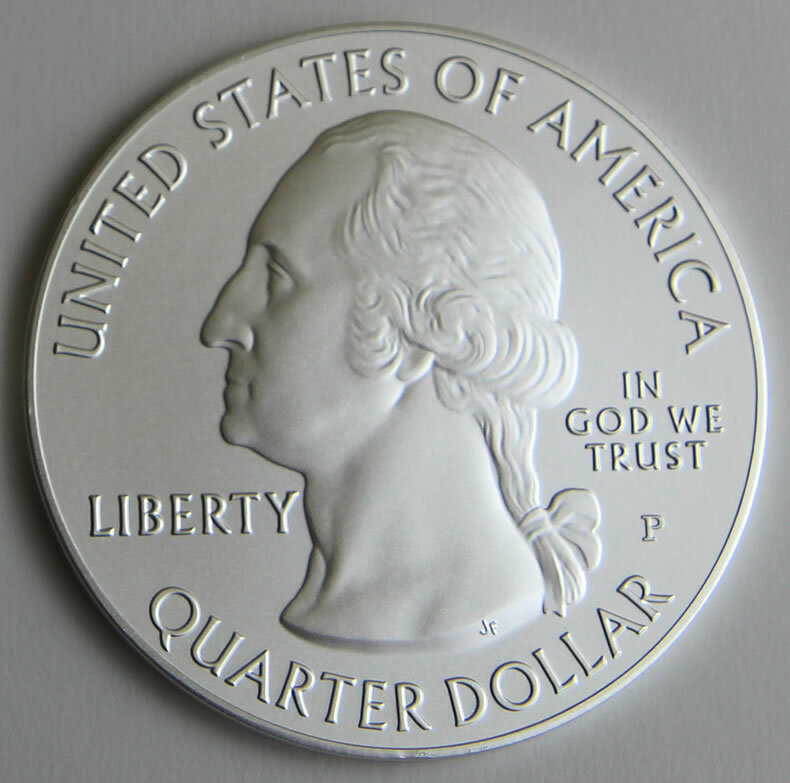 Like those quarters, the obverse offers a portrait of George Washington. The image of the first President of the United States was originally designed by John Flanagan and has appeared on quarter-dollars since 1932. Obverse inscriptions read UNITED STATES OF AMERICA, IN GOD WE TRUST, LIBERTY and QUARTER DOLLAR. In addition, a ‘P’ mint mark is found to the right of the effigy. 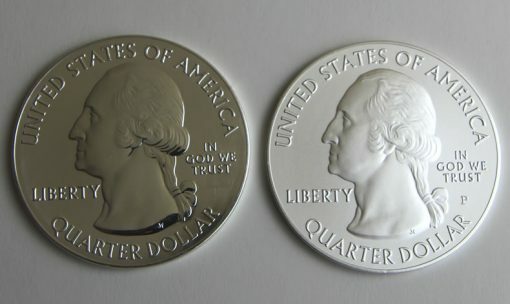 This indicates that the coins are produced at the U.S. Mint’s facility in Philadelphia. An edge inscription reads ".999 FINE SILVER 5.0 OUNCE" to disclose the content of each three-inch coin. Priced at $149.95, the 2016-P Cumberland Gap National Historical Park Five Ounce Silver Uncirculated Coin is available from the U.S. Mint on this product page or by calling 1-800-USA-MINT (872-6468). This coin’s maximum potential mintage limit is 30,000, although that can be adjusted lower if demand is high for the related bullion version. Intended for investors, a bullion edition is also produced by the U.S. Mint. Specifications for it and the collector uncirculated coin described above are almost identical with their finish, mint mark and packaging being the main differences. The uncirculated coin has a matte finish instead of the bullion’s brilliant appearance. The bullion coin also lacks the ‘P’ mint mark despite all five ounce coins originating from the Philadelphia Mint. Here is a photo of obverse sides of America the Beautiful Five Ounce Silver Coins. The bullion version is left and the collector uncirculated edition is right. The collectible coin bears a ‘P’ mint mark below ‘IN GOD WE TRUST’. Bullion coins are also not sold directly to the public. The U.S. Mint reserves the selling of them to authorized distributors who buy in bulk at $9.75 per coin plus silver spot. They are then resold to coin and precious metal dealers and/or the public for a small premium above their melt value. Very nice coin, just got notification from the mint that my Sub’d coin has been ordered for. Thank you for the images Darren, they are truly Majestic! These collector version “P” Mint mark coins have a vapor blast finish according to the Mint since they were first offered in 2010. The bullion versions ship to the Mint’s 13 worldwide Authorized Purchasers in plastic tubes with the coins all touching each other & without a Certificate of authenticity. Seth, I’m amazed that you know how many approved purchasers the US Mint has. I’ve tried finding a list of them, but the Mint stopped providing that information and even denies having any such record of the number of approved purchasers on file, which is ridiculous. The most recent account that I have been able to locate is 11, and that dates back to around 2010. Then APMEX reported a few years ago that it became one of them, making the total number 12. However, these are all in the United States and I did see a list of purchasers who were all located outside the States which contained no US based companies. So the number that I’m seeing is closer to 25 or 30 worldwide. I filed a FOIA request with the Treasury Department & the Mint’s Compliance Officer sent me the official list as of February. There are 13 companies worldwide who are US Mint bullion coin Authorized Purchasers, including 9 in the USA, 1 in Japan, 1 in Luxembourg & 2 in Germany. Seth, That is interesting. I’m glad they are taking a more transparent approach. Just call the Mint’s press office & ask Michael White to send you the current AP list. You might be surprised which companies are & are not on the list! I have never owned any of the 5 Oz quarters. I want one in my hands just to experience what it’s like to hold one.